Spring is springing here in Northwest Georgia. With that comes thoughts of spring cleaning, and for some of us, indoor air quality. It seems that everything in the area has a nice yellowish tint of pollen. That, paired with the fact that I passed three air duct cleaning company vans on the way in to work, got me thinking it would be time to share the benefits of having your air duct system(s) cleaned. A common rule of thumb used by NADCA(National Air Duct Cleaning Association) is "If your ducts LOOK dirty then they probaby ARE dirty". This seems elementary but it is usually true. The first reason is indoor air quality. It is calculated that up to 40lbs of dust is created annually in a normal home just through everyday living. An HVAC system works like the lungs of a home and that dust we mentioned is recirculated 5 to 7 times per day building up in the duct system. This leads to potentially poorer air quality and a need for higher frequency of dusting/cleaning. The second reason to clean air ducts is energy savings.With 25 to 40% of the energy used to heat and cool homes wasted annually dust and contaminants in the HVAC system cause increased strain on the unit and shortens the life. With a clean HVAC system the opposite is true resulting in less contaminates and longer system life. These Emergency Tips will assist you in taking the proper action until SERVPRO of Chattooga, Dade and West Walker Counties professionals arrive. Please follow these DO's and DON'Ts to help reduce damage and increase the chances of a successful restoration. Here are the DO's and DON'Ts for Water damage from Contaminated Water. Call SERVPRO of Chattooga, Dade, and West Walker immediately at (706) 866-5646. 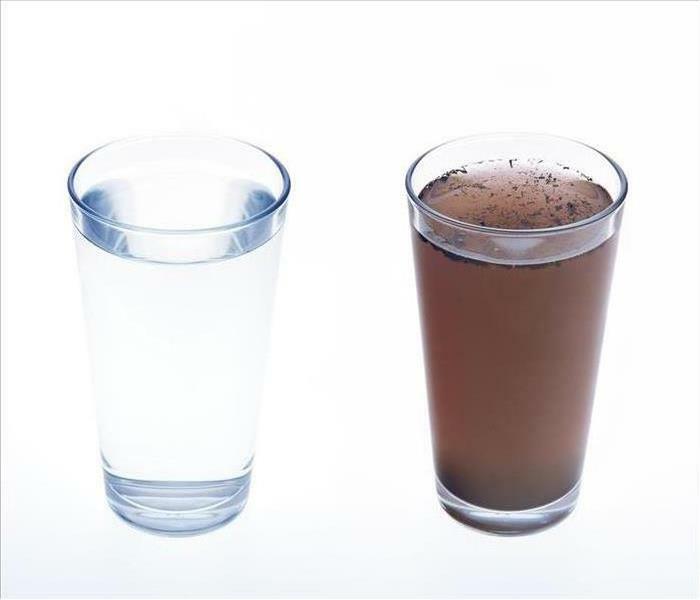 Avoid all contact with sewage and items contaminated by sewage. This includes damages incurred by a sewage backup. Use products for personal hygiene and cleanliness if exposed to contaminated areas. Note: If exposed to harmful waste, OSHA recommends a post-exposure medical evaluation. Consult with your local health department or physician. SERVPRO of Chattooga, Dade, and West Walker specializes in the cleanup and restoration of residential and commercial property after a sewage backup or a contaminated water damage event. Our staff is highly trained in property damage restoration. From initial and ongoing training at SERVPRO's corporate training facility to regular IICRC-industry certification, rest assured our staff is equipped with the knowledge to restore your property. 52% say it would take at least 3 months for them to recover from disaster. 26% of business owners believed that there was a low likelihood that they or their business would be affected by natural disaster. The Eastern Kentucky University Department of Safety, Security, and Emergency Management (EKU) has put together a very informative graphic on the subject of business preparedness. The link to that infographic is (HERE). On May 18-22 of 2013, Severe Weather caused $3.8 billion in economic loss adding to the total of $16 billion dollars in economic loss nationally for the year 2013. The SERVPRO Ready Plan is a tool for property managers and owners, both residential and commercial. It allows for the creation of an Emergency READY Profile. Please contact one our Business Development Representative to setup your free Emergency Ready Profile. If you have any question, don't hesitate to call SERVPRO of Chattooga, Dade, and West Walker Counties! SERVPROworks as a team across the country to help those that have been affected by a disaster. In years past, our local franchise has sent crews to various hurricane sites to help reach customers faster so that they can begin putting their lives back together. 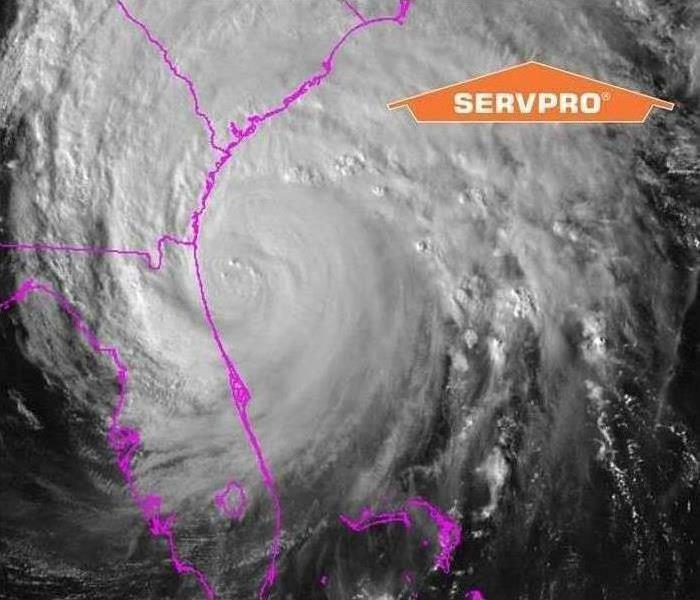 Local crews from SERVPRO has helped with Hurricane storms Ivan (2004), Katrina (2005), Lee (2011), Isaac (2013), and now Harvey/Irma(2017). Being a part of SERVPRO, we know that our job is to help customers and victims of disasters put their lives back together. It's nice to know that if a tornado, flood, ice storm, or any other disaster were to strike the heartland, that there are over 1,700 franchises in our system that can come to our aid to help you put your life back together. Just remember that SERVPRO is faster to any size disaster. 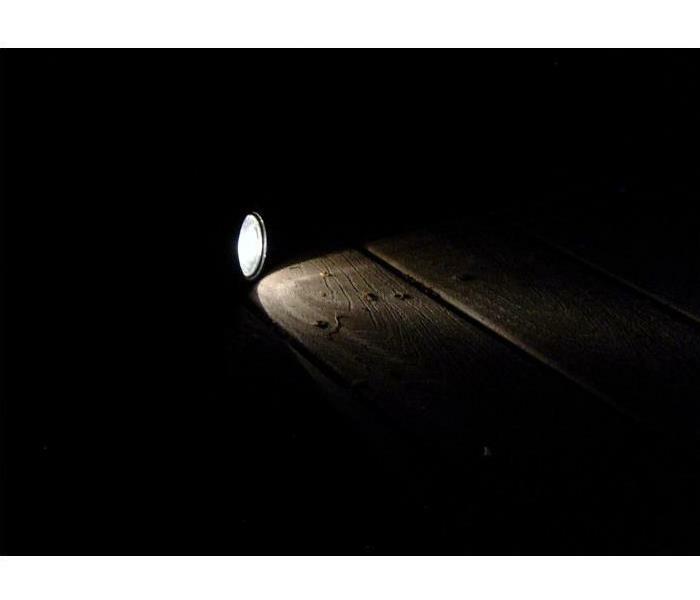 This year, we have seen some major power outages across the nation. Power outages can not only be dangerous to you and your family, but they can also cause immense stress if you are not properly prepared. Make sure you have alternative charging methods for your phone or any device that requires power. Keep your car's gas tank full-gas stations rely on electricity to power their pumps. If you use your car to re-charge devices, do NOT keep the car running in a garage, partially enclosed space, or close to a home, this can lead to carbon monoxide poisoning. Learn about the emergency plans that have been established in your area by visiting your state's or local website so you can locate the closest cooling and warming shelters. If you rely on anything that is battery-operated or power dependent like a medical device determine a back-up plan. Take steps to remain cool if it is hot outside. In intense heat when the power may be off for a long time, consider going to a movie theater, shopping mall or restaurant that may be open in your community. If you remain at home, move to the lowest level of your home, since cool air falls. Wear lightweight, light-colored clothing. Drink plenty of water, even if you do not feel thirsty. Turn off or disconnect appliances and other equipment in case of a momentary power surges that can damage computers and other devices. Consider adding surge protectors. If you experience a water damage after a storm, call SERVPRO of Chattooga, Dade, & West Walker Counties at (706) 866-5646 to remediate your damage and restore you home to pre-storm damage condition. Since each smoke and fire damage situation is a little different, each one requires a unique solution tailored for the specific conditions. We have the equipment, expertise, and experience to restore your fire and smoke damage. 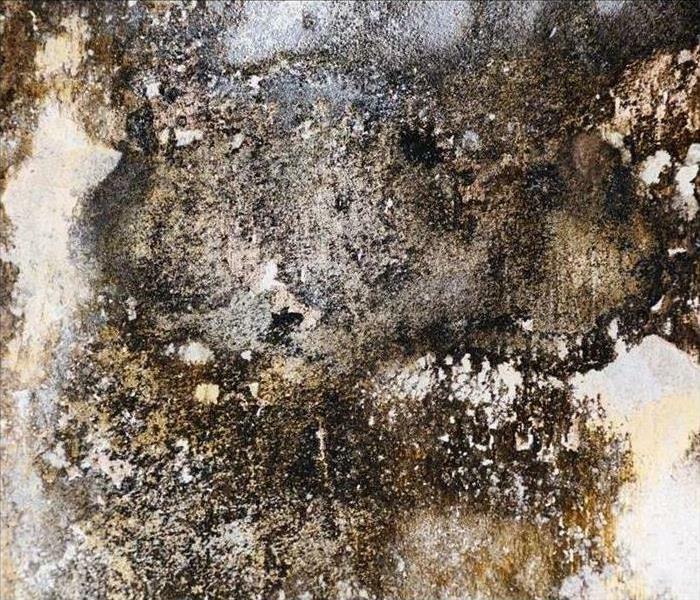 Mold is not quite as common as the Georgia sunshine, but it does happen to many residents. There is a common myth that mold starts due to poor housekeeping or it only happens to hoarders. It is untrue because mold is everywhere. Mold spores only become a threat when they have the right combination of moisture, temperature, and a food source. To stop the threat; an experienced restoration company knows that we need to break one side of that triangle of resources. The easiest method is to remove the source of moisture. 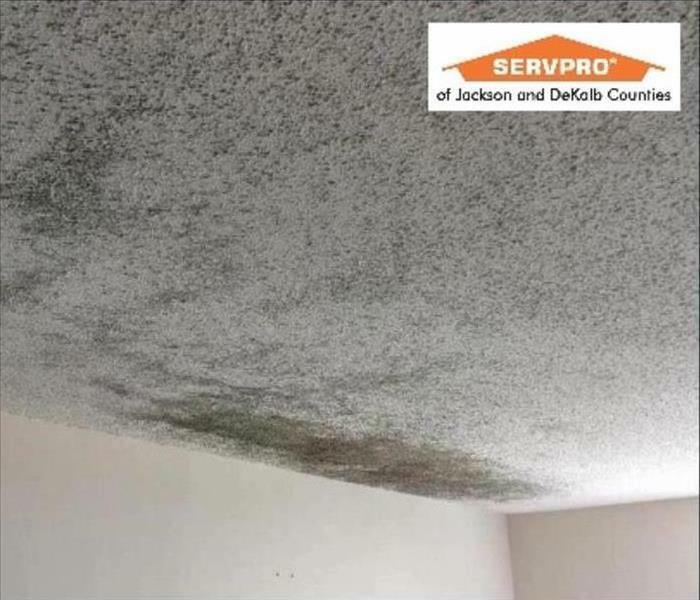 SERVPRO of Chattooga, Dade, and West Walker Counties knows that the sooner we get started, the faster we can stop the mold damage and prevent further growth in a Summerville or Trion home. 1. Is there visible mold in your home? Where is it? 2. Is there a strong, musty odor? 3. Have you had any problems with mold previously? 4. 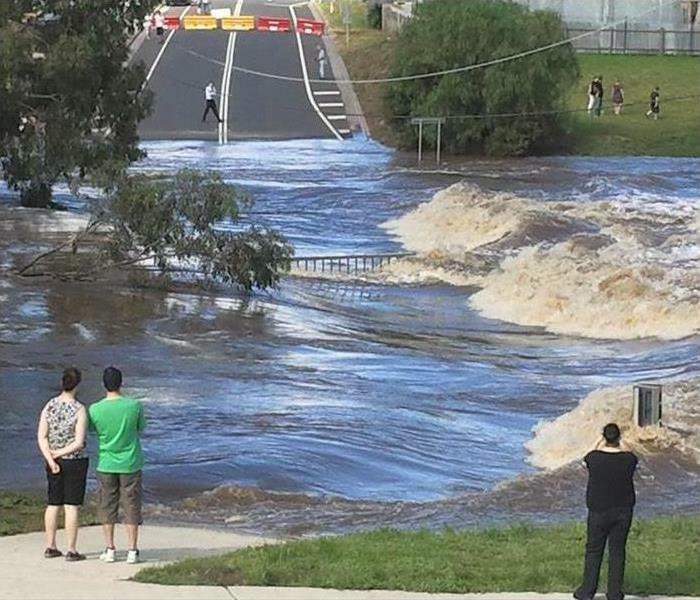 Is there current water damage or have you had water damage in the past? When did any previous damage happen? Once we have this information, our inspectors can quickly find the source of the mold infestation, areas of excess moisture and how to stop both. Technicians begin by removing any standing water. For puddles and other small areas, we use water extractor wands to get into crawlspaces and small areas. 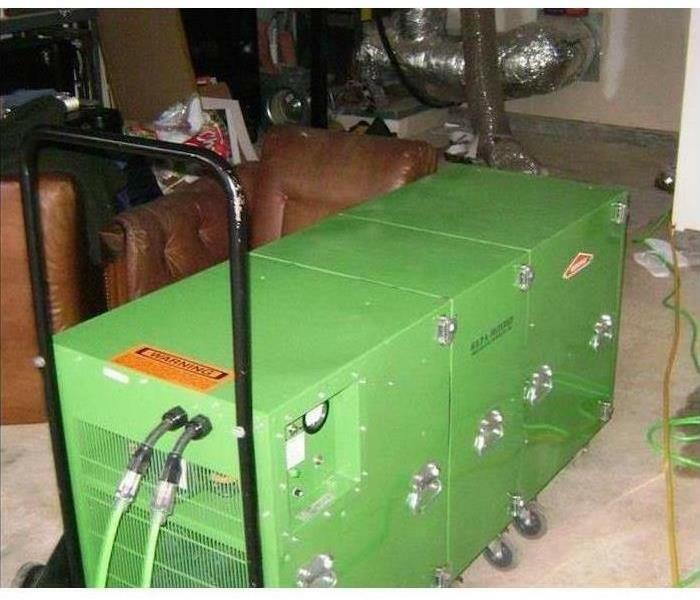 For areas we cannot physically get into, we place a chemical desiccant to draw moisture from the surrounding air or set up a dehumidifier to draw larger amounts of moisture. Some of these machines can draw out over 20 gallons of water per day. Once the air is dry enough, the mold spores return to a dormant state. If the spores are only on a surface, we attempt to vacuum them up or use dry wiping to remove them. Vacuuming and dry wiping get the spores out of the home without adding moisture to the environment. If the spores had time to grow into building material such as drywall, we prefer to remove the entire panel and dispose of it. Attempting to dig out the mold to prevent replacing panels is rarely ever cost-effective. It is a labor-intensive process that adds up quickly on a final bill. SERVPRO of Chattooga, Dade, & West Walker Counties is ready 24/7 to help local homeowners mitigate the effects of storms and weather disasters. Call us at the first sign of trouble! There’s nothing better than coming home after a long, hot summer’s day ready to eat a big supper. Hungrily, you grab a pan, pour some oil, and turn the stove on. Right on schedule, a family member calls to ask about your day and you step outside of the house to talk. After a few minutes, and more than a few goodbyes, you step back inside only to see your entire kitchen is enflamed. 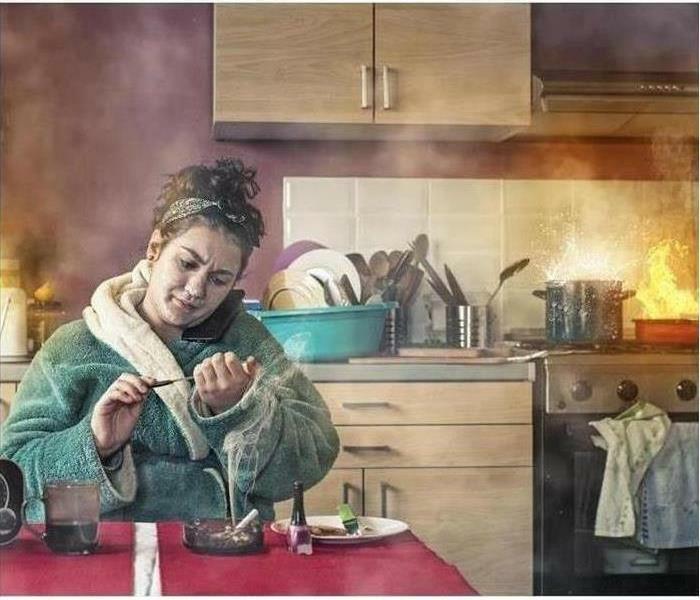 You have officially learned the first of many tips SERVPRO would like to give you today on preventing kitchen fires. Never leave your kitchen unattended. An out-of-sight kitchen means that the kitchen is not within your control. If you have to leave your kitchen, ensure all appliances are turned to off-not just low. Wear your hair pulled back, be sure your sleeves aren’t loose or too long, and don’t wear easily flammable garments. To prevent any unfortunate spills that could result in disaster, keep your work space clear of kids, animals, and company unless given instructions on what to do. 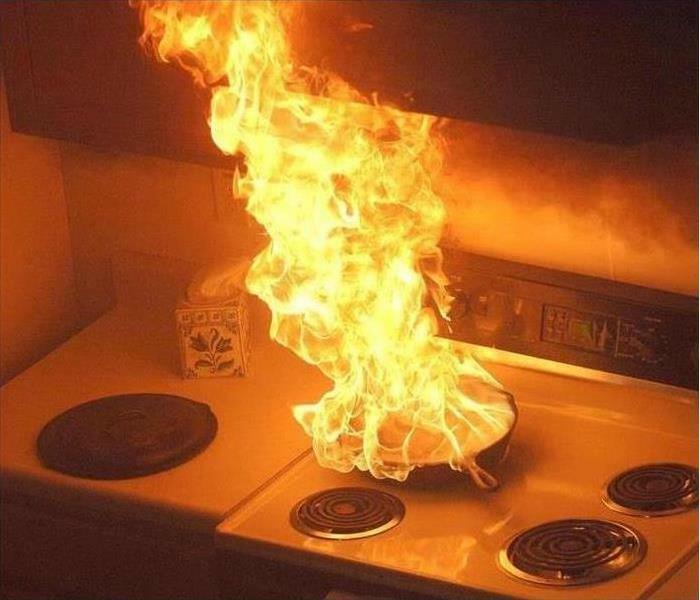 Clear your cooking area of any flammable material. Oven mitts, food packaging, towels, and clean your countertops of grease accumulation. Double Check all surfaces and appliances before you go to bed to guarantee a good night’s rest. Consider taking cooking classes or watching online instructional videos to ensure safe cooking practices. SERVPRO Is Here to Help! 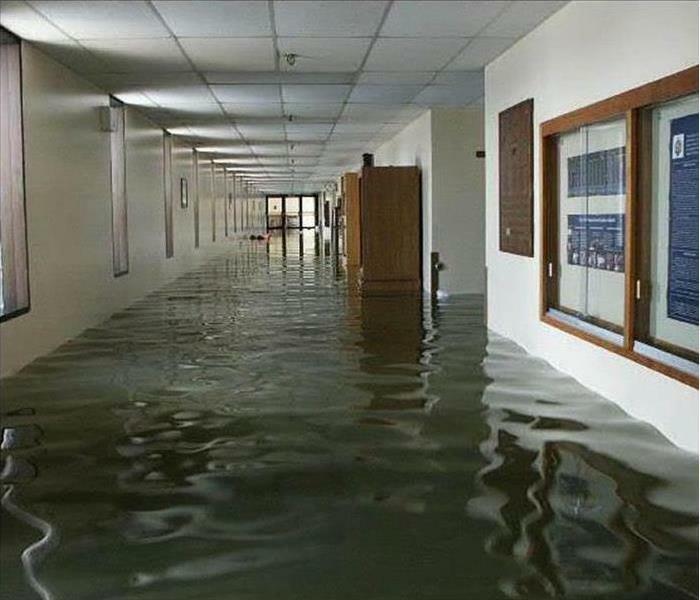 Flooding and water damage events in Trenton, Summerville, or Lafayette commercial properties are often complex with numerous issues that require a knowledgeable and flexible response. Whether we’re dealing with a relatively small water cleanup scenario or a large scale event, we work quickly to assess each unique situation and isolate the damaged area. In many instances, normal operations can continue in a temporary space while we restore your facility. SERVPRO of Chattooga, Dade, and West Walker Counties specializes in the cleanup and restoration of commercial and residential property after a water damage event. Our staff is highly trained in property damage restoration. From initial and ongoing training at SERVPRO’s corporate training facility to regular IICRC-industry certification, rest assured our staff is equipped with the knowledge to restore your property.